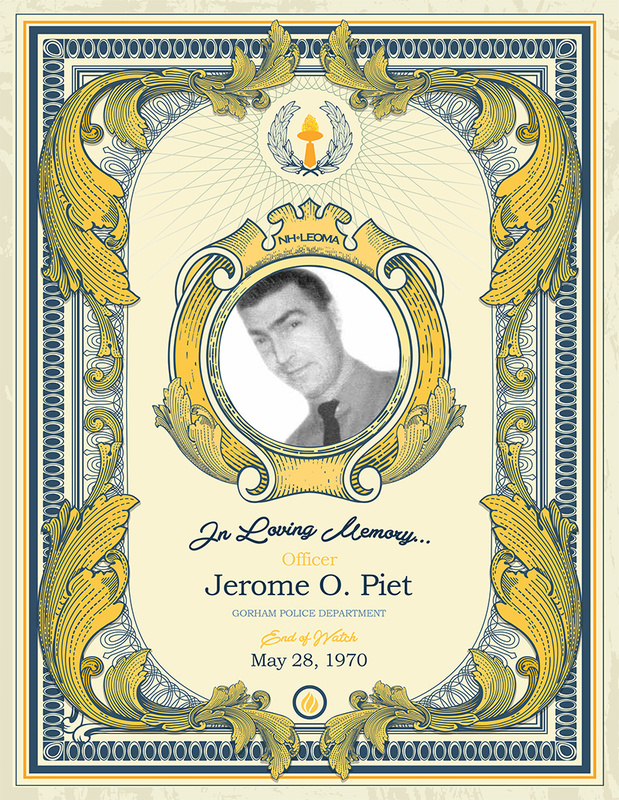 Officer Piet was born in 1937. On May 28, 1970 Gorham Police Department Officers Piet, Robert Bagley, George Webb and Chief Dooan were on duty. At 11:00 pm dispatch received a call reporting a disturbance at a local restaurant, Wood’s Restaurant, Main Street by a male subject. The officers responded to the restaurant and waited for the subject to exit. When he did a struggle ensued and they were finally able to handcuff and transport him to Gorham PD. They were making arrangements to transport the subject to Concord for an evaluation when Officer Piet dropped to the floor. He was survived by his wife, Jeanne Ann, and two sons, James and John.